Salman to tweet mainly in Hindi! Yes he joined Twitter!! On his brother Arbaaz Khan’s say-so Salman Khan reluctantly joined the rapidly-growing brigade of stars on a major social networking website. But Salman says he will tweet mainly in Hindi. Is that a whim, ask the cynics. Or is this Salman’s way of connecting with the heartland? According to a colleague, Salman wants to use the Twitter space to have his say fearlessly. Apparently, Salman’s tweets won’t be about his day-to-day activities but larger issues that touch the common man. 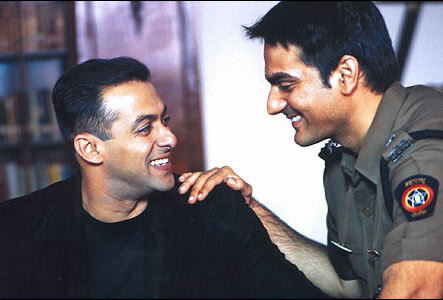 Says Arbaaz, “Salman has started tweeting in Hindi. But it doesn’t mean he will only use that language. We’ll just have to see which way he goes.” The decision to tweet was suddenly taken by Salman on Tuesday morning. Incidentally, with Salman falling prey to the social-networking obsession, there are only two Bollywood A-listers who aren’t tweeting. Ranbir Kapoor and Katrina Kaif. The two insists they would never go on Twitter. My Word: Sallu get Katrina to join! !